The Modern Grid Technique (TJNL) is a great way to show off a bunch of stamps on your card. 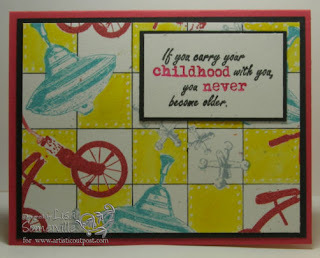 Here's I've used the images from Artistic Outpost's Playtime plate, along with this technique. Artistic Outpost is currently offering FREE Domestic Shipping for a limited time- check out the details here.